There were 35 posts published in January 2007 (this is page 1 of 4). As seen on Sara Jensen’s blog. I found it funnier than she did… perhaps reading Second Life press releases has increased my histrionic tolerance! Tyra Banks, supermodel/altruist, helps a woman whose husband is gonna have to face it, he’s addicted to WoW. Yes, But Can You Five-Man The DMV? Apparently finding housing in San Francisco is now an epic quest. 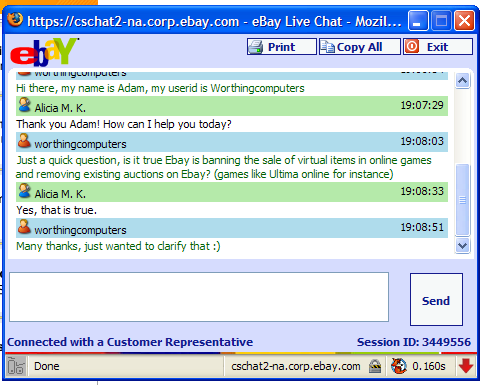 eBay’s proactively removing RMT auctions is huge in and of itself. However, there’s another side to this: note the MMO being referenced in the CS chat. Note that UO is one of the few MMOs that permit RMT, so eBay removing UO RMT auctions would be… pretty huge. In any event, there are still hundreds of RMT auctions on eBay last I checked. Discussion ongoing in the UO community here and here. Markee Dragon, a large UO gold seller/news site, claims to have been contacted by eBay here.